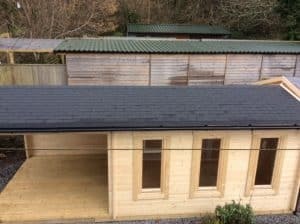 Our installation team has finished another two cabins at our display site in Devon. By now our customers can view five popular cabins with 28, 44, 55 and 70 mm wall thickness. Visitors can also see examples of different roof finishes. 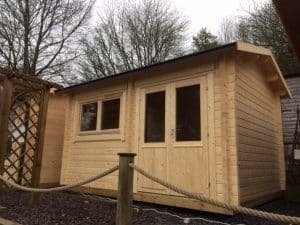 The Hansa Lounge XL is one of our bestselling garden office buildings. 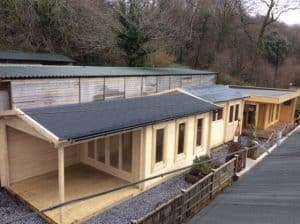 It is also widely used as garden room, studio and ancillary accommodation for visiting friends. 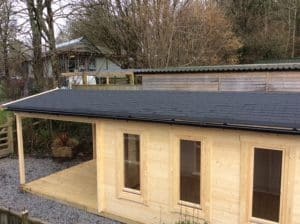 This cabin gives you a good understanding of our 44mm pent roof buildings. 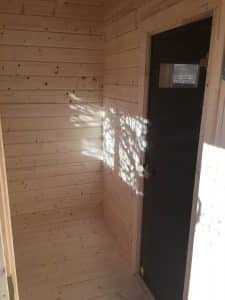 Large wall high windows, double doors and 28mm terrace decking are also featured in this cabin. 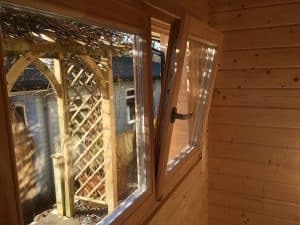 The Anita garden shed is a good example of our budget garden buildings. However, by budget, we don’t mean compromise on quality. 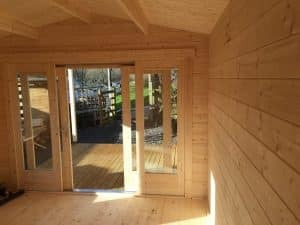 This cabin has 28mm walls, single glazed doors and windows. 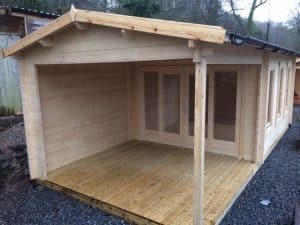 Anita line cabins are the most affordable garden sheds among our log cabin range. The Seattle S BBQ Hut is a typical Scandinavian style building for garden dining and socializing. With two level grills, one adjustable and gorgeous granite table fitted around the fire pit. 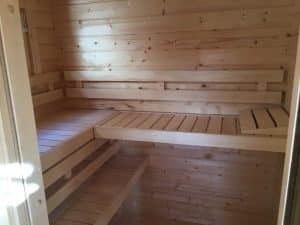 The Sauna Cabin Finland demonstrates our 70mm wall thickness, upgraded window and door quality as well as our standard sauna cabin features. 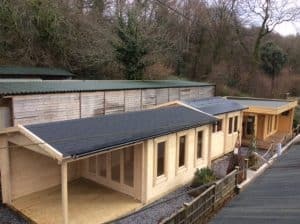 We use the same 70mm wall thickness and upgraded windows for many of our large garden rooms, guesthouses, office buildings and one, two and even three bedroom log cabins. Finally, we have the very popular Garden Room Eva E with generous 3x3m veranda. 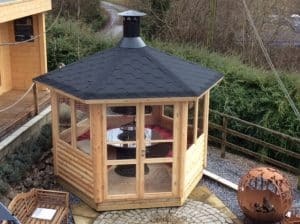 The Eva E is a good example of a typical Summerhouse24 garden room with apex roof. 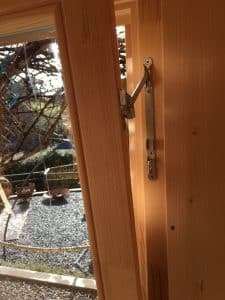 This cabin also features the very popular LU3 type of sliding doors, the same ones we use in many of our bestselling garden rooms and offices. 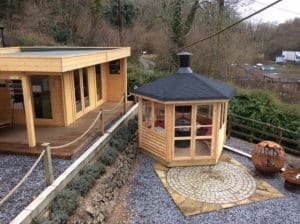 In other words, these five very different garden buildings give you a great understanding of our cabin features, quality and overall appearance. You are all welcome to visit us in beautiful Devon, seven days a week!